Grab your beanies and gloves and head over to Chill in Long Beach CA. It’s a super cool event for everyone: couples, families, solo. It’s really cold inside 32 degrees. They provide down jackets for people who didn’t bring a warm coat. It’s soooo cold that iPhones stop working periodically. What fun! 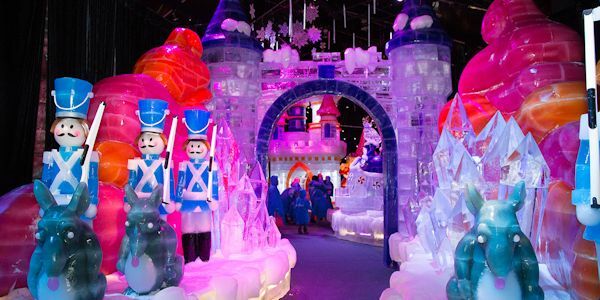 Slides, igloos, ice sculptures, castles…so amazing! What a treat to experience Chill and the winter paradise in So cal. The kids and I loved the ice sculptures, the detail was amazing. 2nd best was the ice slide. Sip creamy hot cocoa while you ice skate with the magestic Queen Mary in the background. Light up the holidays this winter at the Queen Mary’s CHILL as we proudly present Alice in Winterland, an incredible holiday adventure illuminating a holiday inspired re-imagination of the classic Lewis Carroll story in striking colors & equally stunning light fixtures. Stroll through the North Pole Village, delight in our Peppermint Parlor aboard the ship and stop by the Queen Mary Village’s post office to send a letter to Santa. The holiday fun is endless: Take a spin on the Swinging Sleigh Ride, the Giant Rocking Horse or play Prancer’s Paintball for holiday thrills. Thanks to Chill for hosting us at your wonderful venue. As always, thoughts and opinions expressed here are entirely my own.